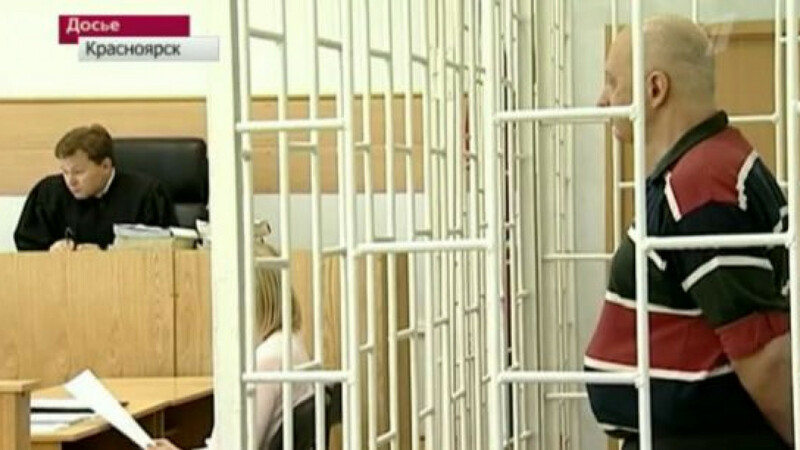 Vladimir Tatarenkov stands behind bars in a Krasnoyarsk courtroom listening to trial proceedings. A notorious mobster has been sentenced to 13 years in prison for masterminding two murders during a gang war for Krasnoyarsk aluminum assets in the 1990s. Vladimir Tatarenkov, also known as Tatarin, was sentenced Friday by a Krasnoyarsk court for killing Alexander Naumov and Kirill Voitenko in 1994. Tatarenkov, who was extradited from Greece, where he was jailed for illegal arms possession, was an ally of Krasnoyarsk businessman Anatoly Bykov, investigators said. Investigators said Tatarenkov masterminded the killings in an attempt to prevent a possible murder plot against Bykov. Bykov denied ever talking to Tatarenkov about killing the two men, Kommersant reported Saturday. Bykov, who is involved in local politics, took an active part in the war over the Krasnoyarsk Aluminum Plant in the 1990s. He was among the three shareholders of the plant, currently controlled by billionaire Oleg Deripaska. In 2000, Bykov was arrested in connection with an attempt to kill a local mobster. He spent a year in detention before being given a suspended sentence by a Krasnoyarsk court in 2002.